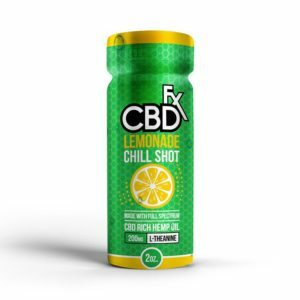 CBDfx’s Chill Shot is a ready to drink delicious lemonade shot with 20mg of full spectrum, organic CBD & 200mg of L-Theanine. L-Theanine is a powerful amino acid found in different kinds of tea. L-Theanine works to improve your natural defense systems. This CBD drink is best served cold. 2 ounce bottle. Available in single, 3, 6, and 12 packs.